The final game of the three game series between the Trojans of North Hall and the Tigers of Dawson was played at North Hall on Friday with the Tigers falling short in a 5 inning mercy rule game. The Trojans would take the sweep of the series. The Trojan bats struck first in the bottom of the first with 3 runs and added 9 in the 2nd, 2 in the third and 4 in the fifth to take the GHSA mercy rule win in 5 innings over the Tigers of Dawson. For the Tigers, the offense wouldn’t give it and Dawson battled for 7 runs in the third to make it a 12- 7 game heading in to the bottom of the inning. North hall answered with 2 of their own to extend their lead to a 7 run margin. The tigers added 1 in the fifth to end their scoring on the day. To reach the 10 run requirement for the mercy rule, the Trojans added 4 in the bottom of the fifth to take the game and the series. 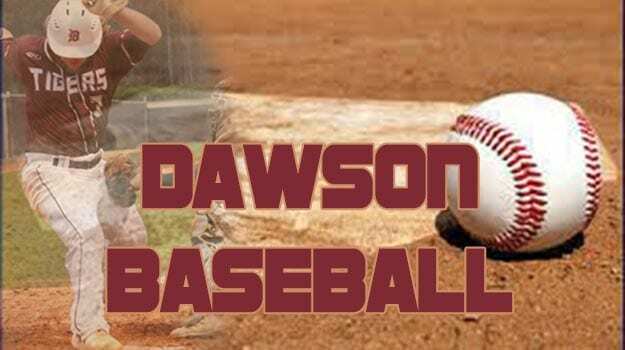 Dawson sent four Tigers to the mound on the day throwing 133 total pitches with 69 being strikes. Thirteen of the eighteen runs for the Trojans were earned and they had eight walks. The Tiger fielders committed 2 errors on the day but overall played a very solid game. The Tigers regular season came to a close on Friday and the coaching staff are preparing to right the ship from a disappointing 10-17 season.